A warm welcome and a friendly, relaxing atmosphere await you at the Avondale. 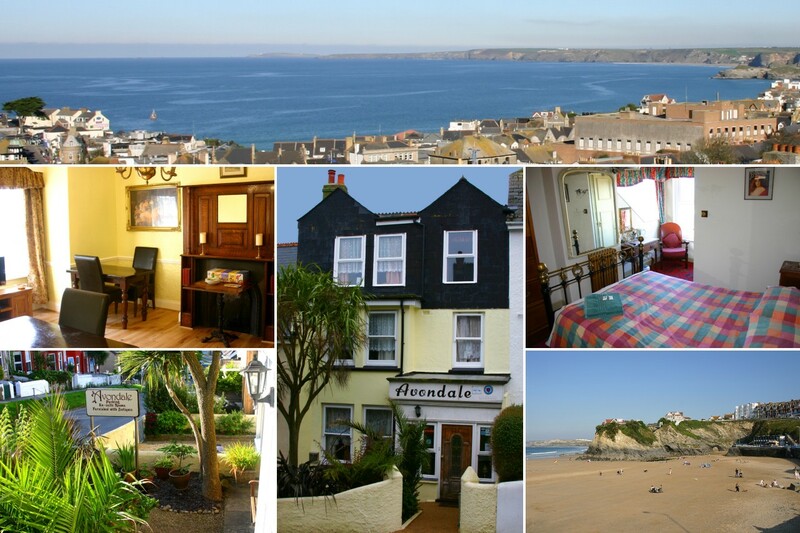 The Avondale is an 8-bedroom guesthouse situated near the centre of Newquay - Cornwall's premier tourist resort and the UK's surf capital. We are open from mid-June to mid-Sept.
By plane: Airlines with flights to Newquay airport include: British Airways, Ryanair and Air Southwest. A taxi from the airport to Avondale will take about 20 minutes. By rail: Newquay railway station is near the town centre. A taxi from the station to Avondale should take just a few minutes. By road: From Exeter, take the A30 (Cornwall). Continue along the A30 for about 75 miles, and then take the slip-road sign-posted 'Newquay'. At the roundabout take the 3rd exit - onto the A39 (sign-posted 'Wadebridge, Newquay A392'). At 'Halloon' roundabout take the 2nd exit - onto the A392 (sign-posted 'Newquay'). At 'Quintrell Downs' roundabout take the 2nd exit - sign-posted 'Newquay' (still A392). At 'Treloggan' roundabout take the 1st exit - sign-posted 'Newquay, Redruth' (still A392). At the junction with the A3075 (Trevemper), take the roundabout's 2nd exit (still A392). At 'Mellanure' roundabout take the 1st exit - into Gannel Road (still A392) - sign-posted 'Town Centre'. At the next roundabout, take the 3rd exit - into 'Mount Wise'. At the first set of traffic lights, turn left into St Georges Road. Then turn immediately right into an access road... where you will find the Avondale car park. Rates are per-person, per-night and include a full breakfast. Children: Special rates are available. Please enquire for details. Please note: the rates shown are based on full occupancy of the room. In other circumstances, a supplementary charge will be payable. Please enquire for details. Deposits: We ask for a non-refundable deposit equal to the charge for the first night's stay. Payment can be made either by debit/credit card or bank transfer. We advise that you take out holiday insurance. On receipt of booking enquiry, we will contact you to confirm availability and proceed with booking if desired. All information submitted is confidential and is never passed on to any third party. To make a booking enquiry, simply enter your details below and then select 'Send enquiry'. Note that this is only an enquiry and you are under no obligation. Click a thumbnail / summary (below, left) to view the full picture and description.